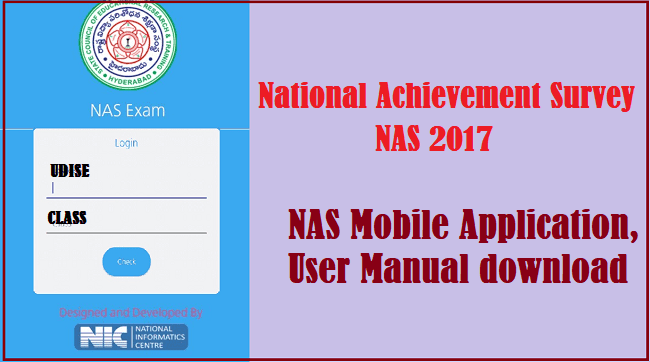 Sub: NCERT, New Delhi - Conduct of National Achievement Survey (NAS) 2017 for Classes III, V and VIII - Preparatory works to be attended by the DEOs- Reg. Ref: 1. Proceedings of the Director, SCERT of even Number Dt.10.08.2017. In continuation to this office Proceedings of even number Dt.10.08.2017, all the DEOs in the State are requested to attend to the following works relating to the National Achievement Survey, Cycle Five for Classes 111, V and VIII personally on priority basis and submit report to the Director, SCERT by 28.08.2017 without fail. School Name and Class, before submitting the basic details. Here user needs to enter his details like Name, Mobile number, Email id and Aadhaar number. In this screen enter all the fields and click on update. Nas Sampling: If you click on this button sampling screen will open. User can do Section sampling, and Exam sampling. 1. Section sampling: Enter the number of sections and click on the ” Do Section Sampling”button. Note: if there are no sections in the school enter 1.
selected section and click on the “Do Sampling “button. In this result screen you can find the all the sampling details like RS, SI, Selected section etc. as show in the above picture. After completion of the exam, you need to enter details of the forms uploaded. In this screen enter both class P.Qs, T.Q and S.Q details and click on “submit” button.